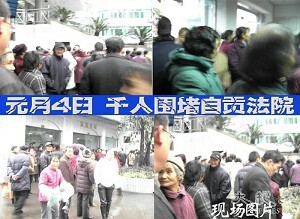 CHINA—More than 1,000 farmers protested outside the Ziliujing District Court, Zigong City in Sichuan Province on January 4, 2007. They were protesting the unannounced cancellation of a court hearing regarding a lawsuit against local police. Around 8:30 a.m. on January 4, 2006, 300 people were waiting outside the court for the hearing. At 10 a.m., more than 1,000 had either gone into city hall or loitered around the courthouse. 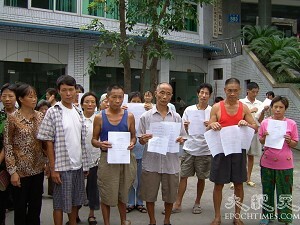 Most of them were farmers from villages in Zigong City who had lost their lands. At around 11 a.m., the villagers started to protest loudly as more people gathered. Under pressure, the court's vice president, Zhao Xunquan, came out to give the crowd an explanation and asked the plaintiffs and the representatives of the villagers to negotiate inside the court. After 4 hours, the crowd gradually dispersed. According to this journalist's investigation, from June 28 to 30, 2006, policemen from Huidong Police Station, Zigong City, violently beat up and detained local farmers attempting to remain on their lands. Many farmers were injured and 11 were detained by the police. Later six farmers refused to plead guilty. The farmers are somewhat illiterate and lack legal knowledge, so they entrusted a local rights activist and freelance writer Liu Zhengyou to represent them in a lawsuit against the police. They engaged Liu, because local lawyers were threatened to not take the case by the authority. A half year later, on December 8, 2006, the court finally accepted the case after the plaintiffs' persistent efforts to go through the process several times. 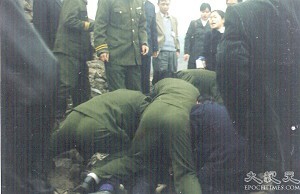 The Ziliujing District Court issued a hearing notice for 9:00 a.m. January 4 to January 11, 2007. On the morning of December 25, the Court informed the plaintiffs to go to the court around 2:00 p.m. that day. During the meeting, the judge advised the plaintiffs not to engage Liu Zhengyou as their legal representative, and also asked them to sign a document acknowledging the postponement of the trial. The plaintiffs rejected the judge's request. The plaintiffs told The Epoch Times that it was advantageous having the support of a thousand people. This is the first case of farmers suing policemen in Zigong City—the lower social class challenging those in power. The case has caused great excitement among the local people because this involves the welfare of tens of thousands of farmers who have lost their lands. This effort has received tremendous support. The farmers have expressed that regardless of the outcome, they will continue with the lawsuit. Their objective is to do something for the farmers and prevent the government from usurping lands at will and bullying these simple farmers.